Text messages increase flu vaccination coverage during pregnancy, according to a new study. Influenza vaccinations, commonly known as flu shots, protect pregnant women and their unborn babies, and even provide protection for the baby for up to six months after delivery. Flu shots are safe to receive at any point during pregnancy but many mothers-to-be resist vaccination; pregnant women should not use the nasal spray vaccine. Influenza is more likely to cause serious illness in pregnant women than in females who are not expecting. The flu can also cause complications in pregnancy and delivery, including premature labor and delivery. Researchers from Columbia University’s Mailman School of Public Health followed 1187 participants recruited from five community-based clinics in New York City that routinely offered influenza vaccines to pregnant women. The scientists assigned women to one of two groups – an intervention group and a control group. Starting in September of 2011, the intervention group received five weekly text messages regarding the importance of flu vaccines along with two text messages containing appointment reminders. The control group did not receive text messages. Women in both groups received automated reminders via telephone. Published in the American Journal of Public Health, the study showed text messages could improve flu vaccination rates. After adjusting the results for gestational age and number of office visits, the study results show that women who receive text messages were 30 percent more likely to get a flu vaccine. Women in their third trimester had the highest relative vaccination rates, with 61.9 percent of the intervention group receiving vaccination as compared to only 49 percent of the control group. Until now, only limited text message reminders and recalls targeted pregnant women. Some of the researchers in this newest study had previously investigated the effectiveness of text messaging to encourage pediatric and adolescent flu vaccinations. Doctors recommend women receive influenza vaccination during pregnancy and do so as soon as the updated vaccine becomes available in autumn. Source: Columbia University's Mailman School of Public Hea. 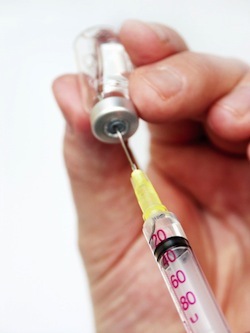 "Flu vaccine rates boosted by text messaging during pregnancy." Medical News Today. MediLexicon, Intl., 14 Jan. 2014. Web. 20 Jan. 2014.